This is the first Edison I've ever laid my hands on. My curiosity -as always- was spiked by reading a lot of very positive reviews about their products. 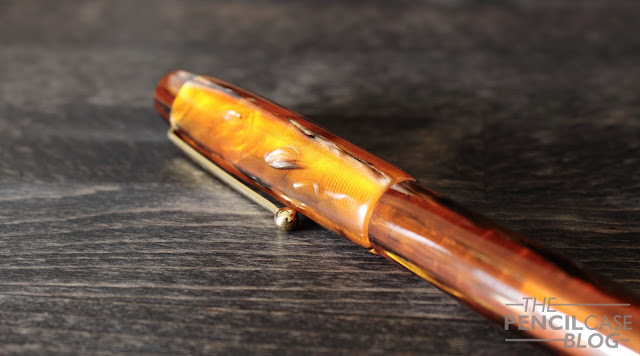 Thanks to Scrittura Elegante, a store/webshop based in the Netherlands, I got the chance to check out one of Edison's pens and give you my personal opinion about it. Edison makes two different kinds of pens: a production line, and a custom 'signature' line. The production line is the most affordable way to get your hands on one of Edison's creations, but there's a limited choice in models and materials. 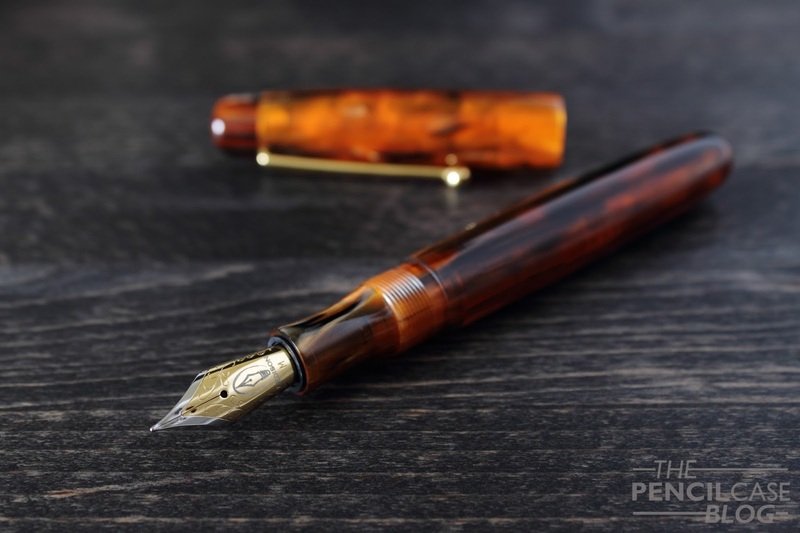 The signature line pens are about twice as expensive (or more), but you do get more variety in models and materials, you also have the option to get different filling systems, make changes to the design and finish (at a premium). 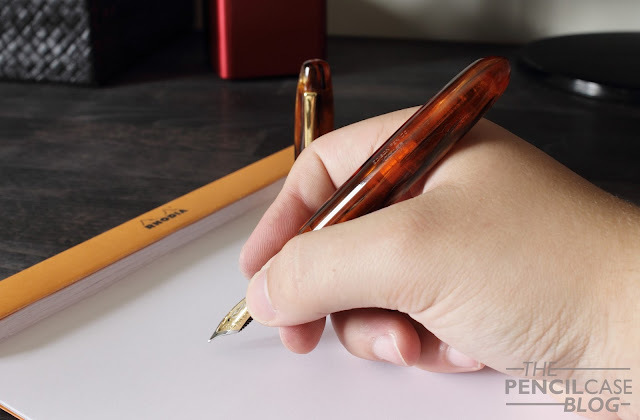 In short, if you're willing to invest, you can have them make a pen exactly the way you want. The one I'm holding right now, however, is a production line model. It's called the Collier, and you can choose from four different materials (each with a dedicated trim color). My pen came in the antique marble acrylic with gold trims. I must say neither the model, nor the finish would have been my personal choice, but it's hard (almost impossible) not to like it when you see the pen in person. The experience, everything from the fantastic material to the great writing experience, really WOWed me. Pictures of this pen don't do it justice. 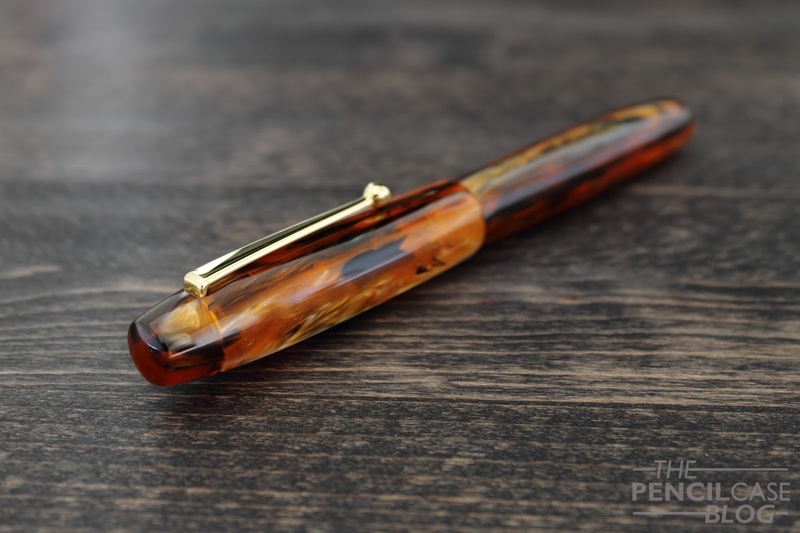 The translucent orange acrylic has streaks of opaque black and pearlescent acrylic scattered across the surface of the pen. It's a bit of everything, with amazing depth, translucency, chatoyance,... Without a doubt, this is the most fascinating material I've ever seen on a pen so far. It's acrylic, so I expected it to be fairly light. however because it's a pretty sizeable pen, it's still a comfortable 30 grams (total). This material really shines when the light catches it! The gorgeous material is accentuated by a gold clip and gold-plated steel nib. The color of the hardware depends on the finish, unlike on the custom models where you can choose those details yourself. I'm not the kind of person that would always choose gold-trimmed pens, however I can appreciate it on the right occasion. 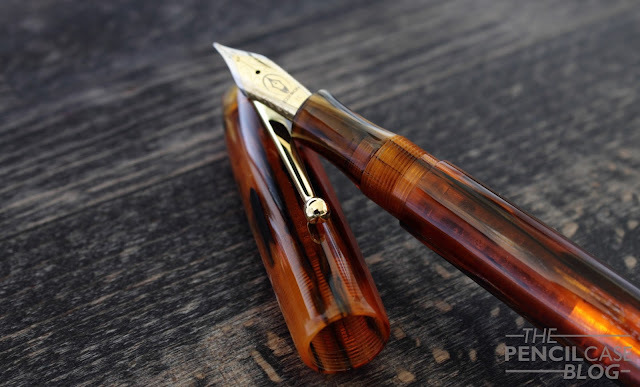 Some pens, and some materials just need gold trims; I'm pretty certain rhodium trims on a pen like this wouldn't look good at all. Besides, it's already a pretty 'in-your-face' kind of pen, it's big, colorful and flashy. So in a way, the gold trims blend in quite well. Have I mentioned how huge this pen is? 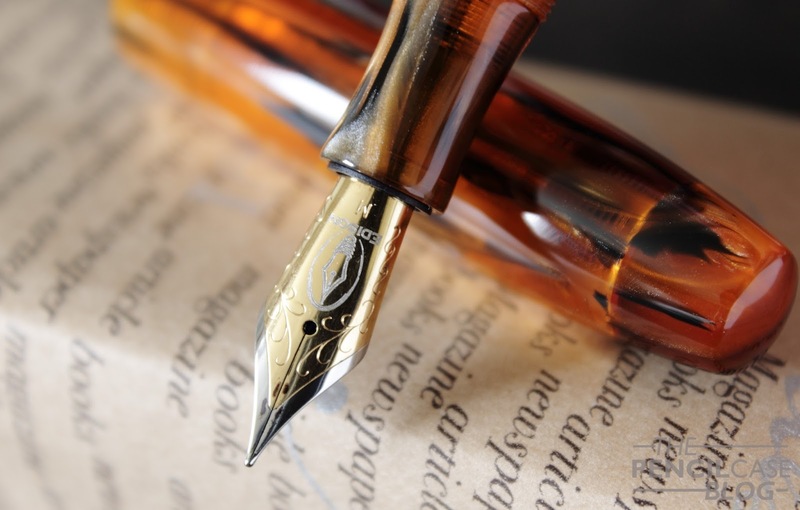 Well let me tell you this: I quite like big fountain pens, I have a few 'oversized' models in my collection, with the biggest one so far being my new Omas Paragon. The Collier has almost the exact same dimensions as the Omas, 150mm long (slightly under 6 Inches) and a ridiulous 16mm wide (3/5 Inch) at its widest point! Initially, the width made me worry about comfort. However, the grip section -while relatively short- has a more comfortable width, and is extremely comfortable to hold. The concave shape is remniscent of what Kaweco incorporates on many of their pens. And if you can recall any of my Kaweco reviews, you know that I've always been quite a fan of the design of their grip sections. The section provides a very secure grip that is comfortable to use for hours straight. The threads are a bit sharp, but oddly enough I never had any issues with them. Same story with the step from section to barrel. It's quite a harsh step, but it didn't bother me while I was writing. I assume this is also because the section forces you to grip it rather close to the nib, away from the threads and step. Because of the sheer size of the pen, I assume it's more than long enough to be used unposted by anyone. That's fortunate, because the cap can't be posted on this specific model (And I don't recommend trying either, cause you'd risk cracking the cap). According to the numerous reviews I read, build quality has always been one of Edison's strong suits. So I expected a pristine pen on arrival, and that's exactly what I got. The material is perfectly polished, I couldn't find any machining marks, and tolerances are very high. Everything fits together nicely. Branding on the pen is kept to an absolute minimum. Brand and model name are engraved on the barrel in a very small and unobtrusive font. I quite like the way they did that, because it reminds me of how vintage pens used to be marked. The steel #6 nib is a standard issue German JoWo nib. It's the kind of nib often used by custom pen manufacturers, and Edison is their American distributor (at least how I understand it). 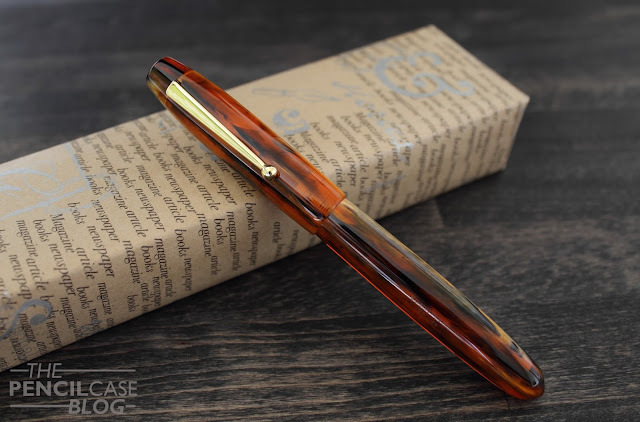 These nibs come with a bit of scrollwork around the edge, and a large blank area on the face that can be laser-engraved by the individual manufacturers. 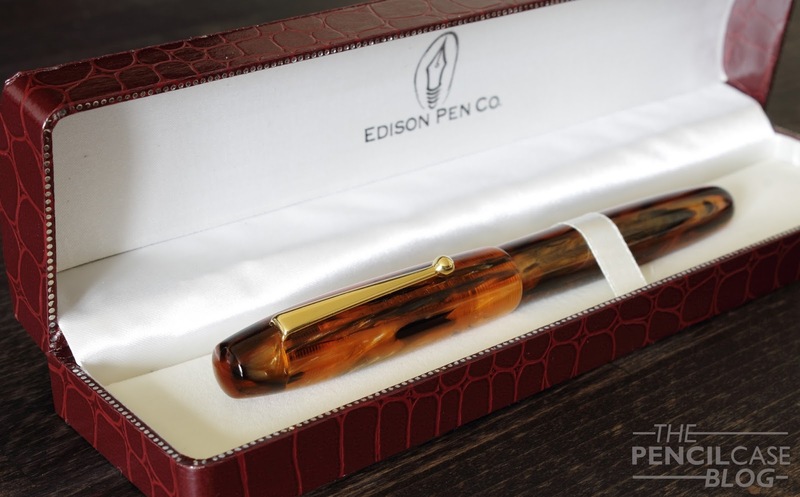 The laser-engraved Edison logo is quite nice, but I'm not a huge fan of how it looks, it's not as clean as the usual stamped engraving you can find on most pens. The writing experience is excellent. The nib definitely lived up to its reputation. I mentioned last week that I prefer a nib with character. 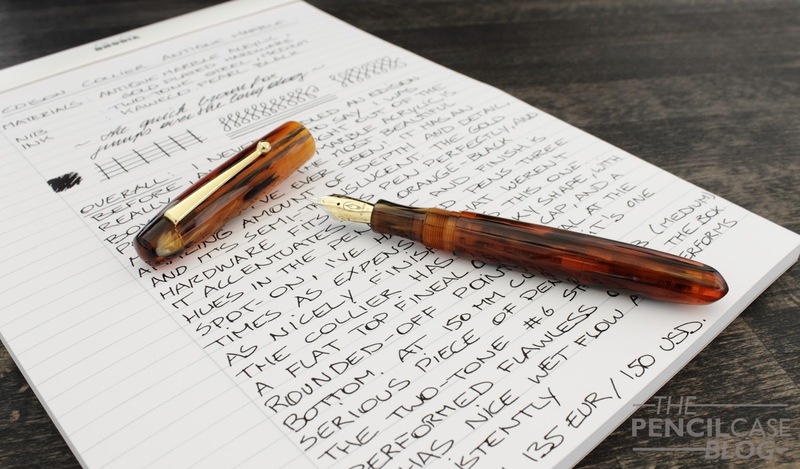 The nib on the Edison leans towards the 'characterless' category, but that's not necessarily a bad thing, it just depends on what you're looking for. I couldn't help but reach for this pen whenever I had to write something down. I guess that's somewhat inherent to the fact that, whilst slightly less exciting, nibs like this always work. Anyway, Edison managed to provide a very reliable writer. It has -what I consider- perfect flow, slightly wet and very consistent (which might have something to do with the funky design of the feed, that has a pooling area right underneath the tines. Perhaps to keep the inkflow steady?). The medium nib writes true to size, and is well-polished with just a hint of feedback. 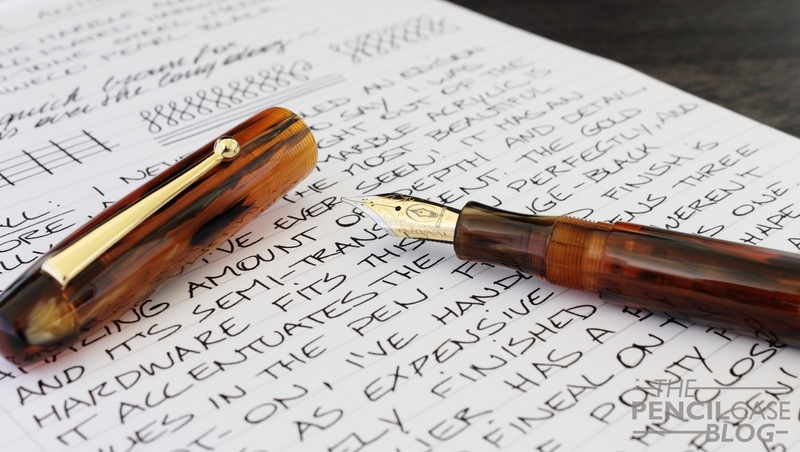 It's not a flexible nib, it's not even noticeably soft, but it's well-made, and reliable, which is probably the most important aspect about a fountain pen for pretty much all fountain pen enthousiasts. At about 135 EUR/ 150 USD, these pens aren't exactly cheap. And we're not even talking about the custom pens Edison makes. For the same price, you can find gold-nibbed pens, like a lamy 2k. On the other hand, if you are somewhat into fountain pens, chances are you already have a lamy 2000, and you just want something else (or maybe you want an affordable way into oversized pens?). In that case, the collier would be a pen I'd totally recommend. Note: Scrittura Elegante Supports this blog. I received this product for free, so I could write this review. I was in no way influenced in the making of this review, the opinions shared here are completely my own! This review does not contain any affilate links. Nice review. When purchasing a custom pen the nib will be tuned to your desire and can embody whatever character you wish. I asked for mine to have a bit of feedback.